What material to use for my Personalised Playing Cards? 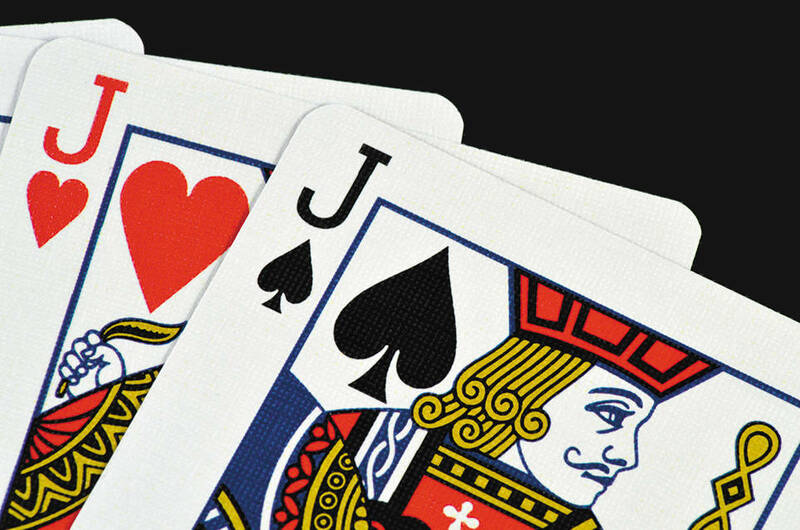 We offer two main playing card stocks – both are casino-grade playing card board, which has been produced with this solely in mind. One is a smooth finish and the other is a textured linen finish. You can request either finish for your personalised playing cards, they are exactly the same price so it is purely down to your personal preference! Both card stocks are the same basic structure – they are two sheets of white card adhered together with an opaque black core, so even if you hold the cards up to light they don’t have any show-through. We plastic coat both in the same manner to offer increased durability, and also improve how your personalised playing cards fan out and shuffle. The linen finish is offered as standard on our poker and bridge sized personalised playing cards, as well as some of the larger sizes. It gives a fantastic glide and allows you to fan the cards out for sleight of hand for magic tricks, or just general handling of the cards when playing card games as they handle fantastically. The smooth finish is offered as standard on our Tarot, Trump and Education size personalised playing cards. As stated earlier it is purely down to personal preference, but if you order a sample pack you can see for yourself the 2 finishes. The smooth cards are great for very visual designs, so for example to show original artwork or photography. To order a sample please use our form on this page.